In today’s “Why I Do UniCamp”, Don “Chatty” Chatelain, a Woodsey Alumni, recounts his experiences with camp in the 1950’s, and demonstrates how even decades later, UniCamp still holds a special place in our hearts. My best personal memory is the aroma of the pine trees as UniCamp was opened for another summer during the 1950s. Irv, Charlie and Ken had to “turn on” the Camp which included our generator and volatile water system. I was in charge of administering SRBs. Luke presided as the staff and counselors prepared for the continuing rush of camper sessions throughout the summer and into the beginning of our busy fall school schedules. Each fall we worked on camper event follow-up from the past summer and recruitment with the Los Angeles agencies to provide kids for the next summer – coupled with a successful Mardi Gras and UniCamp drive on campus, we counselors and staff were eager for each UniCamp summer of serving 1000+ deserving, low income kids, return once again. During each session, at the counselors’ campfire, after a full day of activities, once the kids were in the sack (supposedly – maybe in the Biffy), Luke would tell us that “Camp is for the Kids”. Many of us who hung around the program for a long time realized that “Camp is just as much for the Counselors” (Of course Luke knew that as well and took care to form the counselor experience accordingly). Given the dear kids that Unicamp served in the 1950s, most campers had the outdoor experience of a lifetime and we would only later realize how fulfilling facilitating those experiences was for us counselors as well. On campus, UniCamp was an intense, fun and socially-in, Woodsey (a term coined or at least given more oxygen, in the 1950s) experience, during our UCLA four years (or five or six). Much of our UniCamp student’s character and soul also got worked out in intense camp bonding and involvement, certainly supporting the deserving kids, but mostly derived from the deep and long lasting relationships with other students from all walks of life involved in in the program with you – relationships lasting forever. You may lose track of each other over the years, but the bond will always be there. I speak very personally, having served over ten years (1952-1962) as counselor, Camp Board Chairman, URC LA staff, Program Director at upper site when it opened and then URC Director at UC Riverside. One could not have a more worthwhile “Best of LA” charity to support. Blessings on all the kids who have gone since 1935 and continue to go to UniCamp each summer. Blessings on our community supporters. And blessings on all the counselors, through the years and now, who have helped to provide positive growth opportunities for the kids, while forming and shaping their own lives as well. 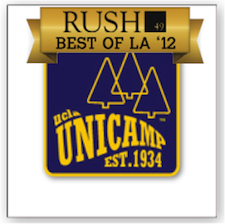 Want to share your experiences with UCLA UniCamp? Did you volunteer with Chatty? Share your thoughts with us in the comments section or email Evi at clau@unicamp.org! Did I ever volunteer with Chatty! I was a counselor at the first College Camp session from UCR in 1960, where he was PD, and our leader at the URC. The sight and smell of the sun on the pine trees brings about such memori es. Woodsey (or is it Woodsy?) counselors/maintenance men are still among my very best friends. Ten of us bought a cabin on the road to the (late) lower site, and are still together after more than 30 years.